Cheering on for the Niuean Group, I watched them as they strongly finished off their performance. Oh Uh, my group and I was up next. "Just have fun and do your best" I repeatedly tell myself. My hands start to get sweaty and I jump around to ease my nerves. "The senior hip hop!" Vivienne shouts, I got myself ready. Everyone claps and screams. Quickly, I rush into my spot and pose, glaring at the crowd who awaits for us to start. What if I fall off the stage? What if people laugh at my dancing? 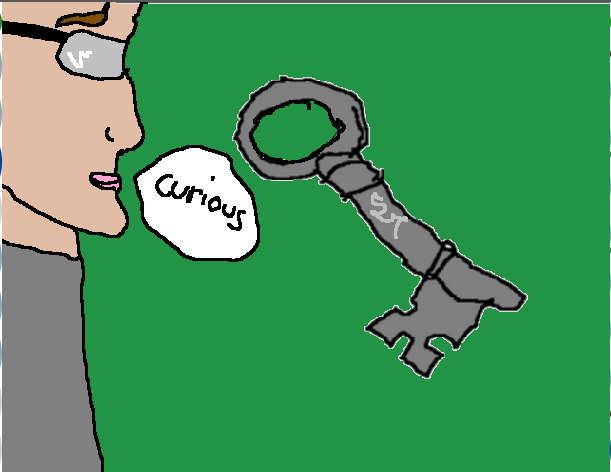 Questions keep rushing through my head. But I suddenly snap out of it. "Just have fun! Who cares!" I whisper. Music starts to play and I get into the mood and start clapping. Jumping up and down, my hair is going everywhere. Coming up to the chorus of the song, my hair starts to annoy me and I can't help but try to fix it but of course as I am dancing. Sweat starts to run down my forehead. Through out the whole thing, I smiled and was SUPER happy! After my group and I performed, all the practises flashed before my eyes. All the hard working practises really paid off. Fiafia was so much fun. REALLY LOVED IT! Adding and Subtracting Positives and Negatives from Team 5 PES on Vimeo. I created a movie showing how I add and subtract positive and negative numbers. This was also made this to show Miss King she understood the strategy. 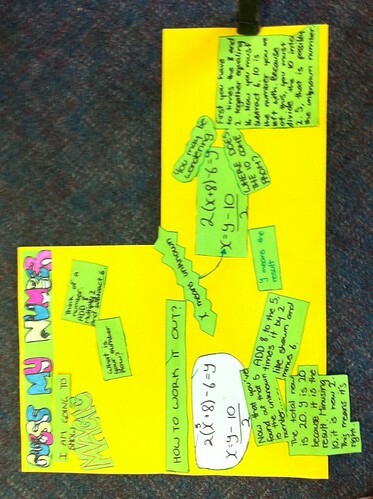 Here is a maths poster I created showing the strategy of 'Guess My Number'. You may be familiar with this as I posted a recent movie about it. If you don't, here is the link. Anyway, this was made to show Miss King I understood it. I hope you like it! Also this very post is my 200th post since I started blogging! AWESOME! Can't wait to reach 300, if I can. The Hippopotamus and the Fireworks! Once upon a time, on a New Years Eve, Hippo the hippopotamus watched the colourful fireworks blow about in the bare sky from his window. Everyday, Hippo had dreamed of a magical moment. Seeing the fireworks in person which meant he had to go and watch the amazing show at Otahuhu. 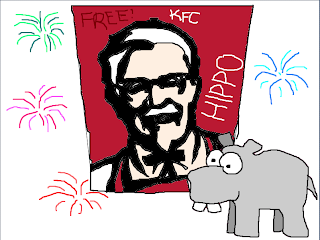 But one day, Hippo watched the news and saw bold words across the TV screen “HIPPOS AT KFC, COME TO THE FIREWORKS SHOW TO GET SOME! FREE!”. Because of that, he knew he couldn’t eat at KFC anymore OR go to the great fireworks show incase they would take him. Why would anyone would anyone do this! Being a rebel that he is, he didn’t respect the works. Poor hippopotamus, he knew what he had to do, miss the Firework show. Looks like his dream was not coming true. Until finally, he found out what he could do to fix his problem. He dressed up like a human and entered the show. Anxiously, Hippo glared at all the humans eating KFC. How sick! No one suspected him, not one person. Finally, something good would happen. He got to watch the fireworks, he was as joyful as ever. Ever since he fixed his problem, he can now watch the Fireworks show every New Years. Hippo has never been happier. The moral of the story is to do whatever you can to make your dream come true. Even if you’re an animal. Waves flowing over his head, Spongebob glided through the strong wave. 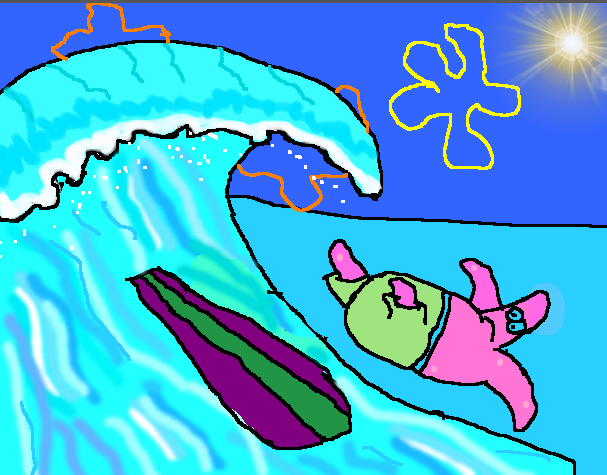 “OH NO!” Spongebob shouts as he falls into the rolling waves. Washing up on the sand, the sea foam bubbled. “Ooooo” Patrick disappointingly shakes his head at Spongebob. Suddenly, Patrick got an idea, a stupid yet clever idea. “Apply the sauce” he exclaims, squeezing out chunks of glue onto his feet, gluing his feet to the surfboard. “I will not be separated from this surfboard” he cries. Drifting smoothly through the ocean, trails are left behind him. Barreling around him, the waves eased. Cockeyed, Patrick felt mellow until he spotted a huge stoney rock. “ROCK! SEPARATE! SEPARATE!” Patrick’s eyes bulged out and he flapped his arms around like a manic, CRASH! his body rips apart. Head first, his skeleton plunged into the sand. Dragged in by the sea, Patrick’s bare skin was still attached to the board or what was left of the board anyway. “I like your sandals” his skeleton compliments. “Thanks, we’re inseparable”. Patrick chuckles. 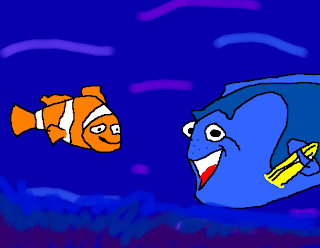 Marlin rests himself on top of the mossy and hard rock, gazing down into the dark midst of the deep ocean miserably, when Dory swims up to him "Hey Mr Grumpy Gills...." as she purses her juju lips. "When life gets you down, you know what you gotta do? ", Dory asks, trying to cheer him up. "I don't know what you gotta do" Marlin argues under his breath. "Just keep swimming! Just swimming, swimming..." she sings repeatedly. Taking Marlin's fin, she tugs him down. Closer and closer, they head towards the gloomy darkness. “Swimming, Swimming...” Dory continues. "See, I am gonna get stuck now, the song is stuck in my head" Marlin hushes her. "Sorry!" she apologizes. Easter Show, it's such a fun place to go with family and friends. Full of fun rides, shows and so much more. Although this year's didn't have many rides, my mum says that they were used for other events. One of spectacular things I did was go in the Inflatable Human Hamster Ball. If you haven't heard of it, it is when they fill a ball full of air and they set you on pool of water. Pretty hard to stand up, with all the rolling. Covering my ears, the ringing sound of the blowing air filled up the ball. "Your good to go" the man said. I leaned towards one side and PLOP into the pool. Underneath my feet, the water flows gently. Carefully, I slowly start to stand up. "Nearly there" I encourage myself. Suddenly, I trip and fall onto the ball. Already, I start to sweat in the hot air. Laughing hysterically, it echoes in the ball. Seems like no one can hear me. Around me, kids try to stand up themselves to find them face planting into the ground. Calmly and in tranquil, I lie down gazing up to the sky. Feels nice to hear nothing but my voice. In the corners of my eyes, I see someone trudge towards my ball. I face him to find him pushing me and spinning me. Everything spins in a blurry tango as I giggle. After all the falling down and nearly injuring myself, it was time for another ride. THE HORROR HOTEL! If you were expecting an actual haunted hotel, it's not. Just a short ride, where you stay seated and ride through the dark gloomy hotel. Next to my mum, she's got the camera ready. "Nothing to be afraid of..." I keep repeating in my head. Closing my eyes and covering my ears, we enter. Written in supposedly red blood, I see clear sheets saying "HELLO" across it. Nothing is worst to me then blood. White lights are flashing through out the ride as I hear screams and screeching sounds of a saw. Still with my ears covered, I open my eyes and peek at what is going on. BOO! A man jumps out scaring the socks out of me. Opening my mouth to scream, nothing comes out. My throat is completely dry. Out of the hotel, my mum laughs, saying "HA! That wasn't scary". I shake my head. Another thing we did was visit the farm world which was so much fun considering I am an animal freak. Sheeps, cows, goats, pigs! Wow, it was like heaven. In my hands, I held some food for the animals. Creeping up to a lamb, I hold out my hand. It steadily starts to eat off of me. I feels it's tongue licking all the food. SO ADORABLE! Ferris Wheels, totally fun right? No, the answer is no. You may think that it is nice since you see the great view unless you are afraid of heights. Which is exactly like, I'm such a soft person. Anyway, I hold onto the bars tightly. A bead of sweat rolls down my forehead. Around and around we go. I start to loosen up a little. "No need to overreact, Gloria" I whisper. Hearing the creaks of the rickety old ride kinda of got me a little nervous but afterwards it was all right. The Easter Show was super fun. I got face art which looked like scars and cuts on my face. But I wasn't expectiong to go. My mum just woke me up and asked me if I wanted to go. REALLY!